"By describing your diabetic patients as having 'hyperglycemia' instead of being 'uncontrolled,' you may have six times greater risk adjustment impact for next year." That was the message I recently delivered to a roomful of primary care physicians during a documentation seminar. In short, words matter. 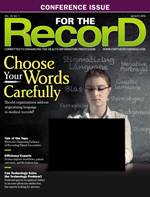 The proper specificity of diagnostic phrases affects patients, health care systems, and the reputations and wages of physicians. However, clinical documentation improvement (CDI) physician advisors (PAs) have not used this line of thinking until recently. Instead, they focused on diagnosis-related group (DRG) management. Supporting inpatient CDI efforts among provider staff and educating clinicians to adopt a more defined set of criteria for diagnoses such as sepsis, acute respiratory failure, and acute kidney injury are tasks familiar to virtually every CDI PA. But risk adjustment? Presented to an outpatient provider audience? That's a rarity. America's health care payment and delivery systems are experiencing a drastic sea change. Health and Human Services has established a framework that eventually transitions away from fee-for-service. The model moves toward reimbursement that focuses more on population health and rewards value (defined as high-quality, cost-efficient care). But value-based care is not a distant goal—organizations are being held accountable today. In this new framework, complete, accurate, and specific documentation of patient diagnoses is essential to success. Clinical practitioners must be willing to adapt to these documentation demands. They need to understand the impact proper documentation has on their patients, the health system, and themselves. The person most ideally positioned to incentivize providers to adapt is often one of their own—a fellow physician in the role of PA. Traditionally, the PA has been an extension of the inpatient CDI team, serving as liaison between CDI staff and providers, communicating bidirectionally to help both parties succeed. Interacting with payers, administration, IT, and ancillary health care staff is also frequently part of the PA purview. Nevertheless, of all the roles assigned to PAs, the singularly most important task has been to help providers adopt this message: "Describe your patients as sick as they truly are." • capacity to model proper documentation behavior. Documentation issues most often involve specification of medical diagnoses. A broad knowledge of conditions across all specialties is crucial for a PA to influence documentation behavior within those specialties. Physicians with experience comanaging patients with a wide variety of specialists are best equipped to address issues important to those specialties. For this reason, hospitalists and pulmonary/critical care providers are often ideal PA candidates. PAs should have earned the respect of their colleagues. This involves the provider demonstrating not only sound clinical management skills but also a calm, respectful demeanor when communicating with physicians, patients, nurses, and other clinical as well as nonclinical staff. The ideal PA must be available to both providers and CDI staff (clinical documentation specialists and coders). An effective PA encourages colleagues to respond to queries, discuss frequently misunderstood diagnostic criteria, and listen to frustrated providers regarding obstacles to proper documentation. Effective PAs are "in the trenches" managing patients with their colleagues. When clinicians see the PA contending with similar workflow efficiency challenges, it engenders the sense that the PA understands the array of demands placed on providers. This in turn enhances the likelihood that CDI issues will be well received by providers conversing with their PA colleague. Lastly, stalwart PAs consistently model the documentation behaviors they are promoting. A note filled with dictation errors, conflicting documentation, or poor specificity will detract from the PA's educational message. Conversely, a PA note that uses complete, accurate, and specific terms to support the diagnosis can help other clinicians understand how to properly describe patient care. In the shift toward value-based care, risk adjustment, a statistical process that considers differences in patient characteristics (including health status) to account for variations in outcomes and costs, features prominently. Risk adjustment is utilized by the Centers for Medicare & Medicaid Services (CMS) and commercial payers to predict the future resource needs of enrollees. Two common methodologies used for risk-adjusted reimbursement are DRGs (inpatient only) and hierarchical condition categories (HCCs), which risk adjust using diagnoses and ICD-10-CM codes from both inpatient and outpatient claims. Whereas DRGs are heavily based on acute disease manifestations, HCCs are weighted more to account for chronic disease burden. 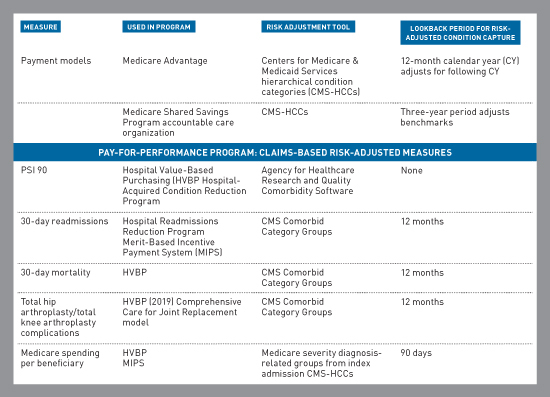 The CMS-HCC model is used by Medicare for risk-adjusted payment allocations for both MSSP-ACO patients and Part C (Medicare Advantage plan) enrollees. Medicare also uses CMS-HCCs and related versions to further modify payment to hospitals and providers in the form of incentives and penalties. These will be applied to both physician pay and hospital DRG-based reimbursement under CMS pay-for-performance programs. The financial impact on both providers and hospitals can be substantial. While DRG management remains critically important, PAs can no longer be focused solely on optimizing documentation capture for complication or comorbidity or major complication or comorbidity. To help providers and health care systems thrive in this new environment, PAs must become familiar with the structure of CMS payment models and pay-for-performance programs that use claims-based risk adjustment methodologies. The PA's role now transcends the confines of the inpatient setting. The use of CMS-HCCs and lookback periods to risk adjust these various measures relies on documentation capture from outpatient clinicians as well. PAs must be able to articulate the importance of documentation completeness, specificity, and accuracy to those providers who no longer manage hospitalized patients. Incentivizing proper documentation and coding habits will occur by helping outpatient practitioners to understand how properly describing their patients impacts providers, patients, and health care systems. As ambulatory CDI programs mature, the need for the PA to act as the interface between the CDI staff and ambulatory providers will become crucial. Like on the inpatient side, query compliance will need to be promoted. Many health care systems realize that the role of PA may be becoming too broad for a single person to handle. Strategies to divide duties among two or more PAs can ease the burden for busy physicians. • subsets of service line PAs to assist with quality-based outcomes measurements such as those found in a hospital's pay-for-performance program. These providers can collaborate with CDI PAs to address any related documentation issues. As health care moves into a population-focused model, effective PAs are set up to be game-changers. First, health care organizations must identify physicians with the appropriate traits to handle the PA role. Then, by promoting PA training in DRGs, HCCs, and risk adjustment, a substantial return on investment will be realized. — Brett B. Senor, MD, CRC, CCDS, is a physician associate for CDI quality initiatives at Enjoin.